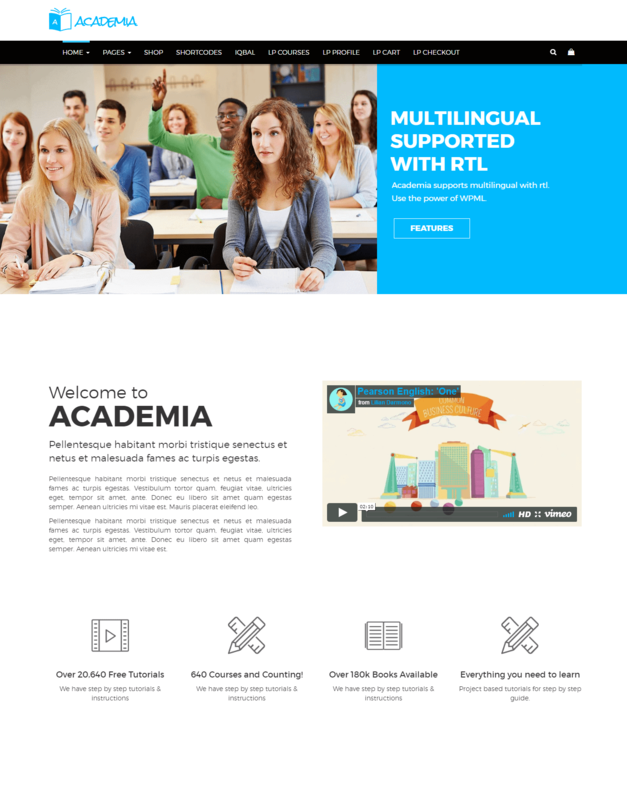 Academia is a responsive Educational WordPress theme with the latest trendy, well-documented, stunning user interface that can surely make a great first impression on your institution. It represents your institute as well as the courses in a very professional manner. Head over to Academia download page on www.themeforest.net then download the AcademiaPackage.zip file. In this .zip file, you have everything you need. There are a couple of simple steps to install Academia theme on your server. Its quite straightforward. If you are starting from the scratch, we recommend you to follow the installation guide below to install with the pre-built existing demo data. This is the simplest way to get started. Please go through the below video to watch step by step procedure. 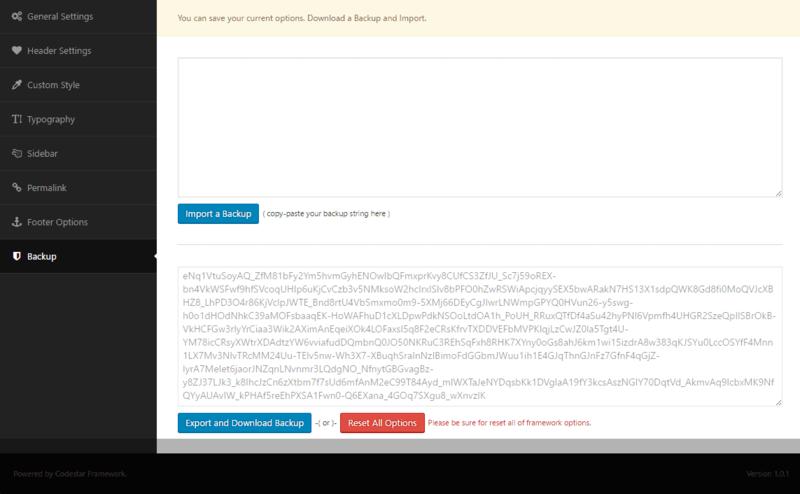 You can find this package inside the downloaded .zip file of Academia theme. So, before getting started with the installing process, Extract the .zip file and you'll find the desire academia.zip in the Theme folder after the extraction. Now, go to Appearance> Themes> Add New> Upload Theme then click on the Choose File button then select the academia.zip file and hit upload. Academia Core: theme core functionality (CPTs and shortcodes). WooCommerce: For selling Publication or Book. "Contact Form 7" (optional). We recommend this for the contact form. Demo data files can be found in Demo folder after you extract the theme package and the path should be /Demo/academia-content-demo.xml. Widget setting file can be found in Demo folder after you extract the theme package and the path should be /Demo/widget_data.jason. 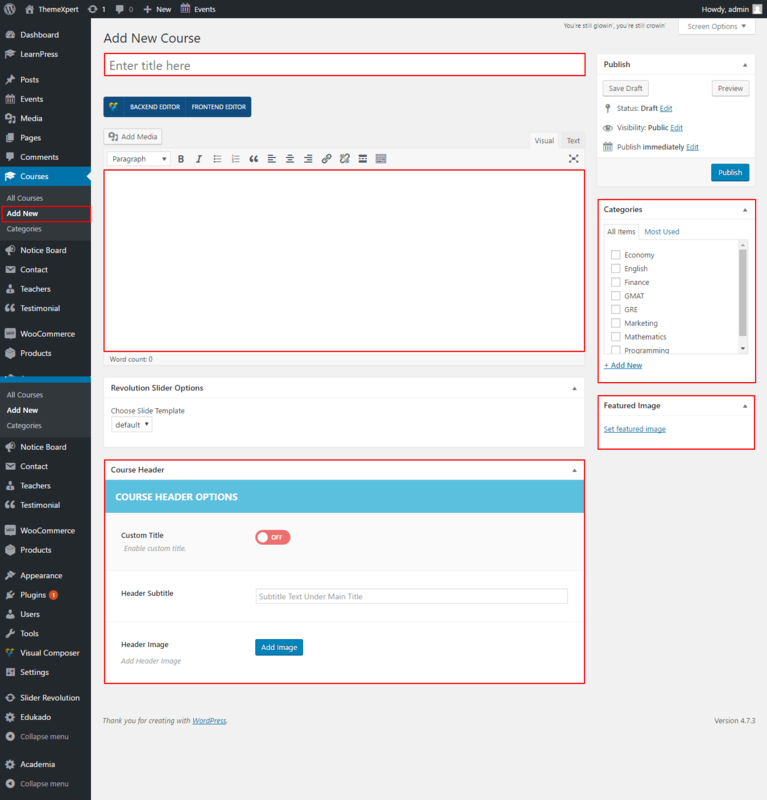 Click on Academia at left-bottom corner of the module screen to open up Theme Setting panel. 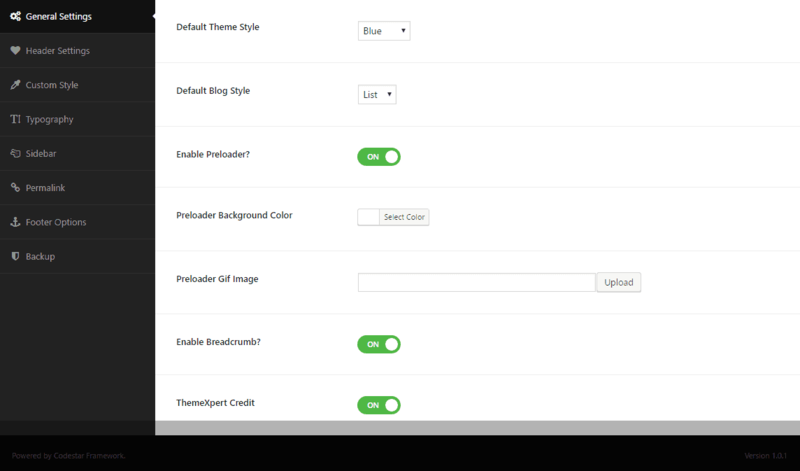 Default Theme Style : Choose the primary theme color from the drop-down menu. Default Blog Style : You can either select List or Grid style for the blog with this option. Enable Preloader : Allows you to enable or disable Preloader. Preloader Background Color : Set a color for the preloader background. This option can only be found when the Enable Preloader option is enabled. Preloader Gif Image : You can select the preloader gif image with this option. Enable Breadcrumb : Allows you the control over enabling or disabling breadcrumb for your site. ThemeXpert Credit : Keep it enabled if you want to give us credit. You can disable this option either. Select Header Variation : Select the section are from the right side preview and its customization settings will appear right below this. Header 1 Sticky Logo : Upload your site logo for the Header 1 Sticky Header. This above two options will appear only if Header 1 is selected from the right side preview of Select Header Variation option. Header 2 Logo : Upload your site logo for header 2. This above option will appear only if Header 2 is selected from the right side preview of Select Header Variation option. Header 3 Logo : Upload your site logo for header 3. Header 3 Sticky Logo : Upload your site logo for the Header 3 Sticky Header. This above three options will appear only if Header 3 is selected from the right side preview of Select Header Variation option. Header Background Color : Choose a color for the header background. Sticky Header : Allows you to enable or disable Sticky Header. Custom Style : By default this option is disabled. To enable this option, a couple of settings will appear to customize according to your preference. Header Primary Color : Allows your to set header primary color. Header Top Link Color : Allows your to set header Top Link color including Regular color, Hover color, and Active color as well. Menu Color : Allows your to set Menu color including Regular color, Hover color, and Active color as well. Body Primary Color : Allows your to set a color. Body Link Color : Allows your to set Body Link color including Regular color, Hover color and Active color as well. 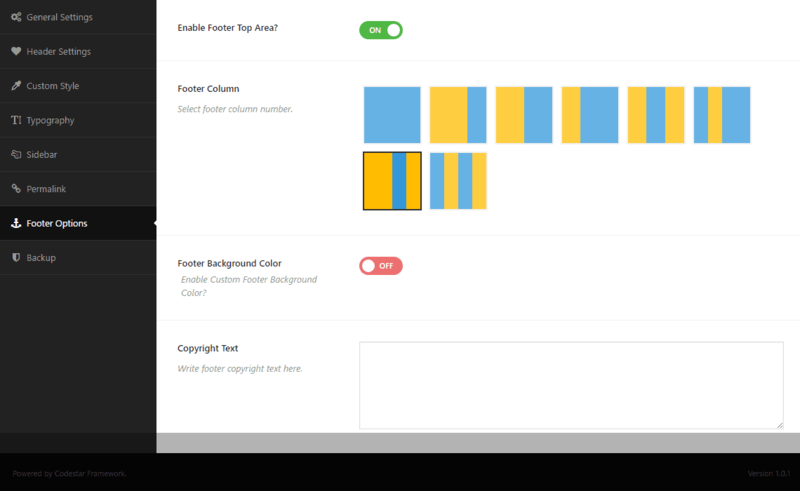 Footer Primary Color : Allows your to set footer primary color. 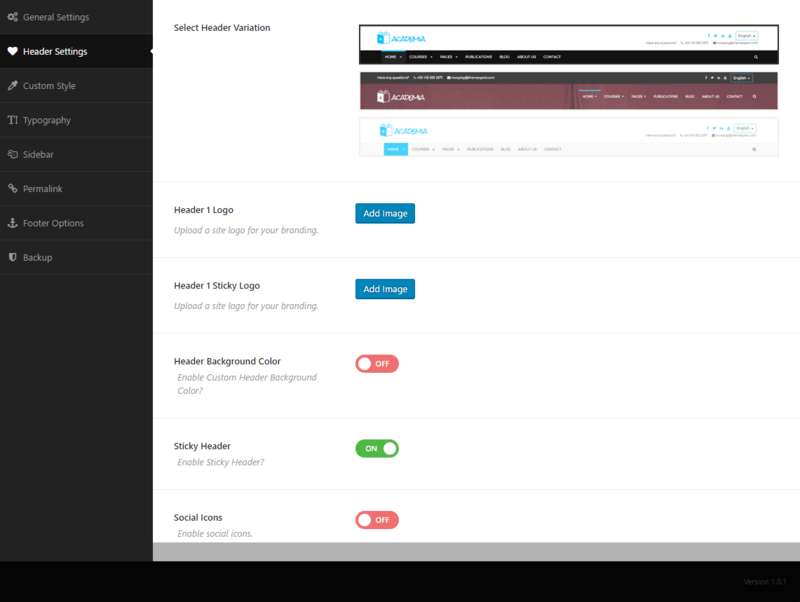 Footer Link Color : Allows your to set Footer Link Color including Regular color, Hover color and Active color as well. Those above seven settings can be found only if you enable the Custom Style feature. Custom CSS : Write custom CSS code here. Custom JS : Write custom JS code here. Custom Typography : This option allows you to use thousands of google fonts in different sections in your site. First, enable this to get the customization settings to appear. Select Header Font and Style : Allows you to select a font style and font type for the header section. Select BodyFont and Style : Allows you to select a font style for the body. 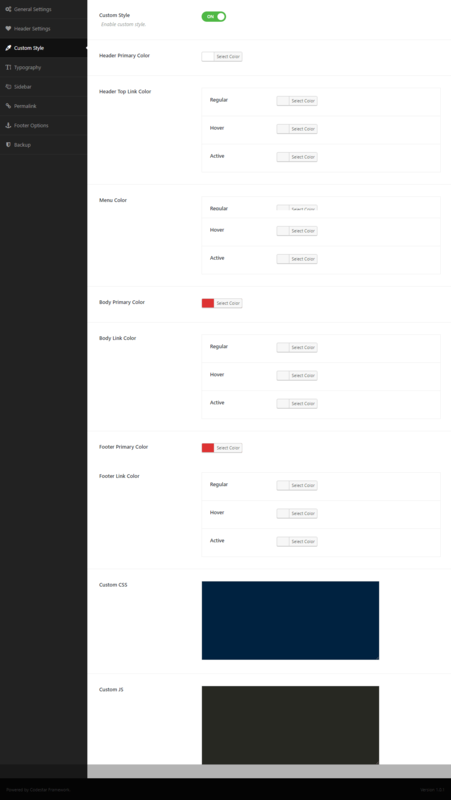 Select FooterFont and Style : Allows you to select a font style and font type for the footer section. Custom Permalink : To enable this feature allows you to customize permalink according to your needs. Course Slug : Write your desired custom slug for the Course Post Type in the empty text box next to this option. Notice Board Slug : Write your desired custom slug for the Notice Board Post Type in the empty text box next to this option. Teachers Slug : Write your desired custom slug for the Teachers Post Type in the empty text box next to this option. Testimonial Slug : Write your desired custom slug for the Testimonial Post Type in the empty text box next to this option. Course Category Slug : Write your desired custom slug for the Course Category Taxonomy in the empty text box next to this option. Notice Board Category Slug : Write your desired custom slug for the Notice Board Category Taxonomy in the empty text box next to this option. Course Name Slug : Write your desired custom slug for the Course Name Taxonomy in the empty textbox next to this option. After you generate your own preferred custom slug, its IMPORTANT to go to Settings module from the left sidebar and click on Save Changes button in the bottom-left corner. 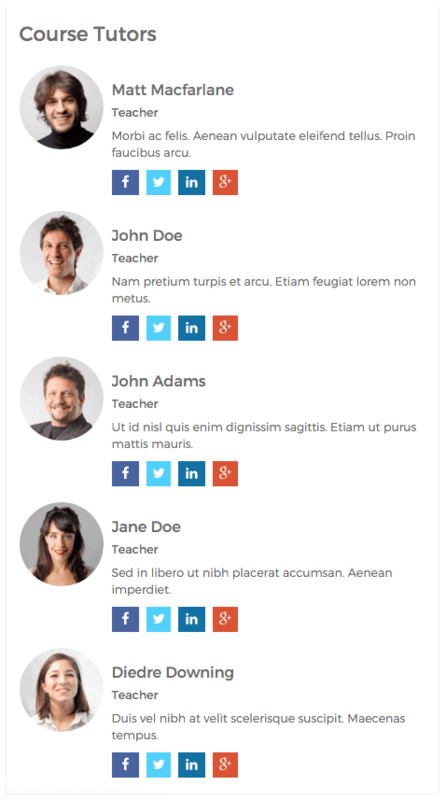 Footer Column : Define the number of columns you need in your site footer. Footer Background Color : Choose a footer background color. Import and Backup : This button allows you to import a backup theme. Just to paste the backed up string on the empty text box and then click this button. Import and Download Backup : With this button, you can make a backup of your current theme. Go to Pages> Click Add New button. Give a page title on the Add New Page text box. Click on Publish button to save the page. If everything is done ok then you can find those created pages on Appearance> Menus. 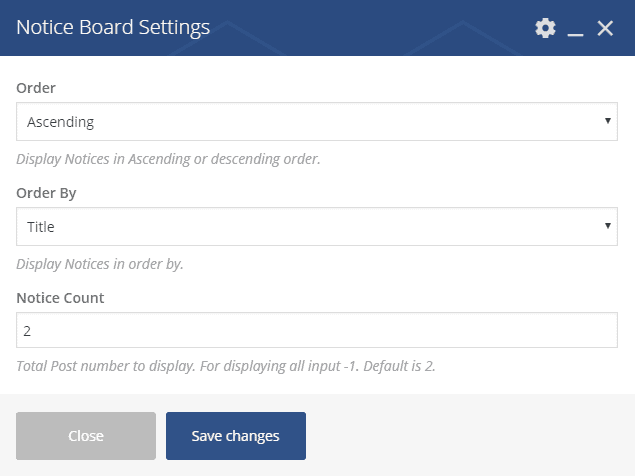 Now, you can create Menu and assign those pages in different menus. Select a main-menu and drag the submenu items right below the main-menu. First, make a drop-down menu including sub-items into the sub-items. Click the expand button of the parent menu of megamenu and check the option Enable megamenu. Expand the sub-menu items then set a numeric number on megamenu column grid to define the number of columns within a total of 12. ( If your megamenu subitems are 2 then the number should be 6, as 6+6=12, if subitems are 3 then it is 4, as 4+4+4=12 ). Make sure Enable megamenu heading option is checked in. After everything is done according to the right way, click Save Menu button to save the settings successfully. Go to Notice Board> Add New and a configuration module will appear. Enter the notice title on the very first empty text box. Write notice detail content text on the content area. You can import media like images, audios etc. on the content area simply with the Add Media button above the content area box. On the right side of the module, select or create a new category for the notice and add a featured image for the event as pointed on the screenshot. Go to Courses> Add New and a configuration module will appear. Enter the Course title on the very first empty text box. Write course detail content text on the content area. You can import media like images, audios etc. on the content area simply with the Add Media button above the content area box. On Course Header tab, you can use a custom title, header subtitle and header image. On the right side of the module, select an existing category or create a new category then select, and upload a featured image for the course as pointed on the screenshot. After everything is done according to the instruction, click on the Publish button from the right-top of the module and your done adding a new course successfully. Go to Teacher> Add New and a configuration module will appear. Enter the Teacher title on the very first empty text box. Write Teacher detail content text on the content area. You can import media like images, audios etc. on the content area simply with the Add Media button above the content area box. 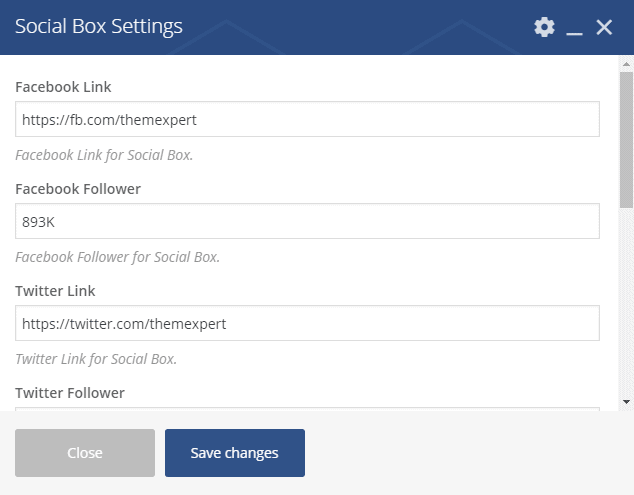 On Social Link tab, You can define the social profile link of the teacher. On the right side of the module, select an existing Course name or create a new Course then select, and upload a profile image for the teacher as pointed on the screenshot. After everything is done according to the instruction, click on the Publish button from the right-top of the module and your done adding a new faculty successfully. Go to Testimonial> Add New and a configuration module will appear. Enter the Testimonial title on the very first empty text box. On Testimonial Details tab, You can write the name of the person, position as well as details content text of the person. On the right side of the module upload a client's image for the testimonial as pointed on the screenshot. You can add an element on a page in two different ways. 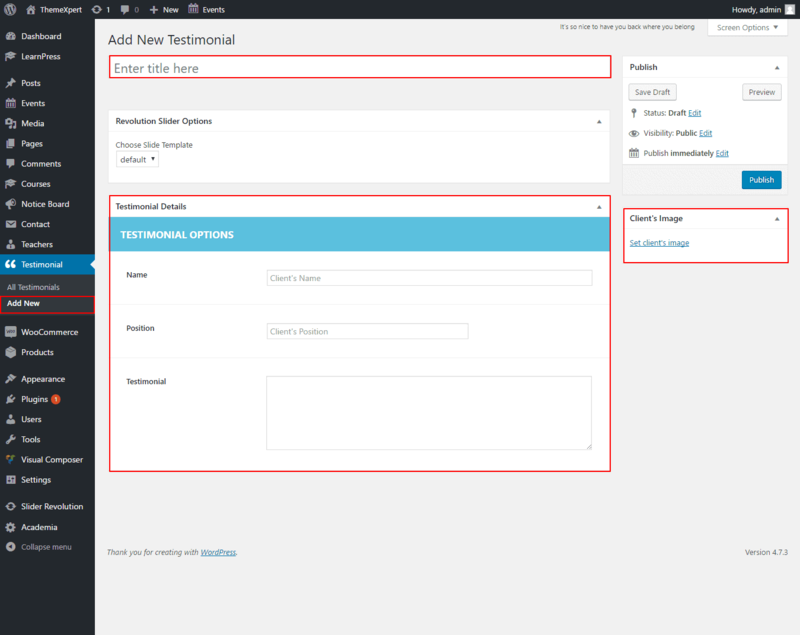 Either you can use just the simple shortcode on the content area of that page or you can add element manually. 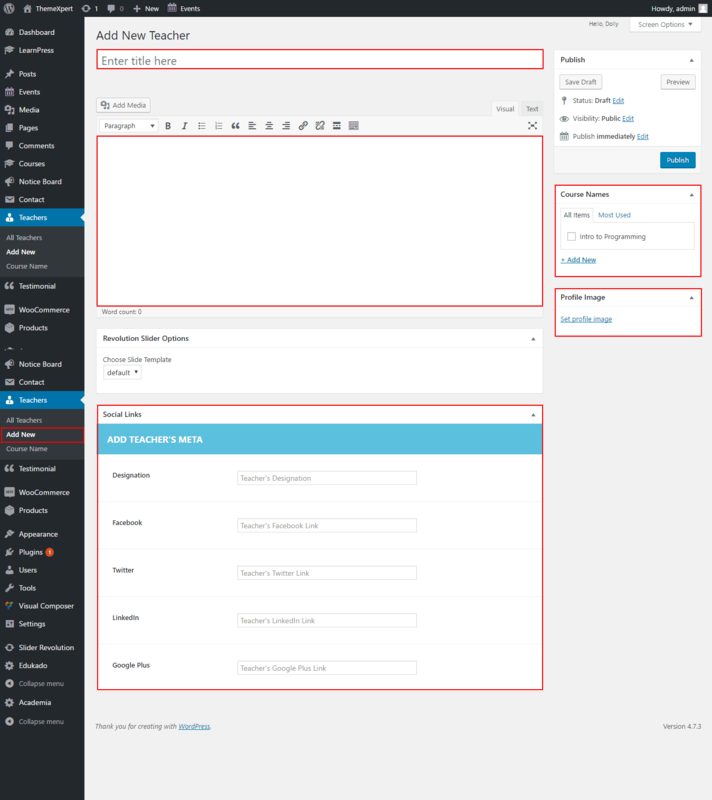 You will have plenty of default elements to add or you can add our developed elements those are only for Academia theme from the Academia tab. 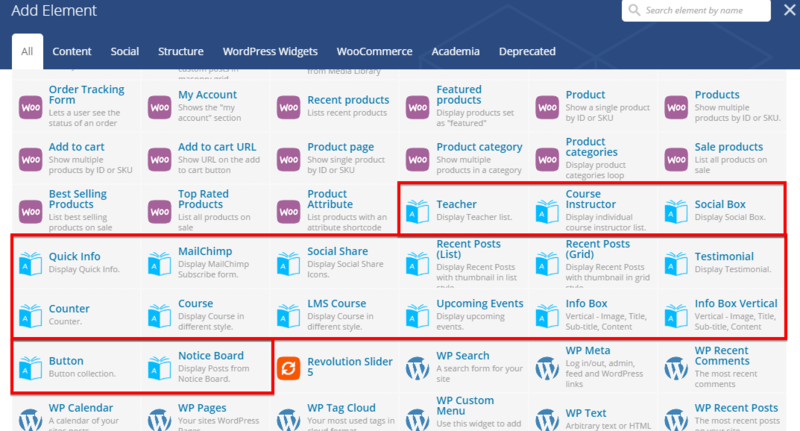 Our developed elements those are only for Academia theme can be found in Academia tab under Visual Composer. Order : You can display teachers either in ascending order or in descending order with this option. Order By : You can display teachers ordered by Title, Name, Date, or Random. Total Number : Define the number of teachers to show. Input -1 to display all teachers. Select Course Name from the drop-down menu. 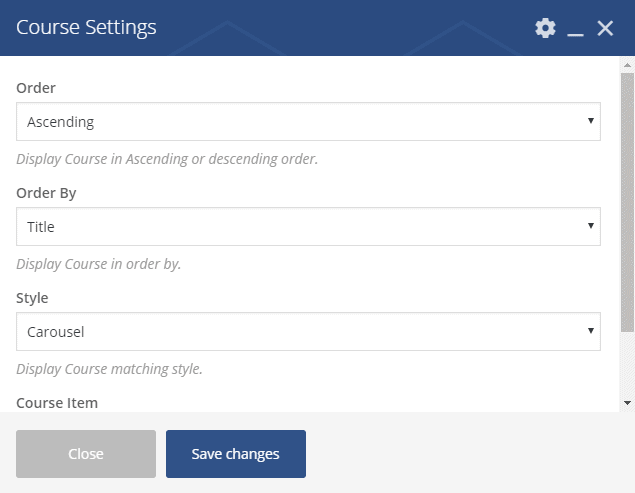 Order : You can display Course Instructors either in ascending order or in descending order with this option. Order By : You can display Course Instructors ordered by Title, Name, Date, or Random. Course Name : Select a course from the drop-down to display its instructors onto your preferred page. Facebook Link : Give your facebook profile link here. Facebook Follower : Define the number of facebook followers you want to show. Twitter Link : Give your twitter profile link here. Twitter Follower : Define the number of twitter followers you want to show. Google Plus Link : Give your google plus profile link here. Google Plus Follower : Define the number of google plus followers you want to show. LinkedIn Link : Give your LinkedIn profile link here. LinkedIn Follower : Define the number of LinkedIn followers you want to show. Icon 1 : Select a icon for info 1 by simply clicking on the right side arrow button next to this option. Info 1 : Write info 1 here. Icon 2 : Select a icon for info 2. Info 2 : Write info 2 here. Icon 3 : Select a icon for info 3. Info 3 : Write info 3 here. Icon 4 : Select a icon for info 4. Info 4 : Write info 4 here. Icon 5 : Select a icon for info 5. Info 5 : Write info 5 here. Icon 6 : Select a icon for info 6. Info 6 : Write info 6 here. Icon 7 : Select a icon for info 7. Info 7 : Write info 7 here. Icon 8 : Select a icon for info 8. Info 8 : Write info 8 here. Icon 9 :Select a icon for info 9. Info 9 : Write info 9 here. Icon 10 : Select a icon for info 10. Info 10 : Write info 10 here. Title : Title for Subscribe Form. Action Link : Action Link of your MailChimp account. Email Label : Label for Email field of the Form. Button Label : Label for Submit Button of the Form. Show Facebook? : You can enable or disable showing facebook sharing icon. Show Twitter? : You can enable or disable showing twitter sharing icon. Show LinkedIn? : You can enable or disable showing LinkedIn sharing icon. Show Google Plus? : You can enable or disable showing Google Plus sharing icon. Order : Display post in either Ascending or Descending order. Order By : Display Recent Posts in order by Title, Date, Name or Random. Post Item : Define the number of posts you want to show on this module. 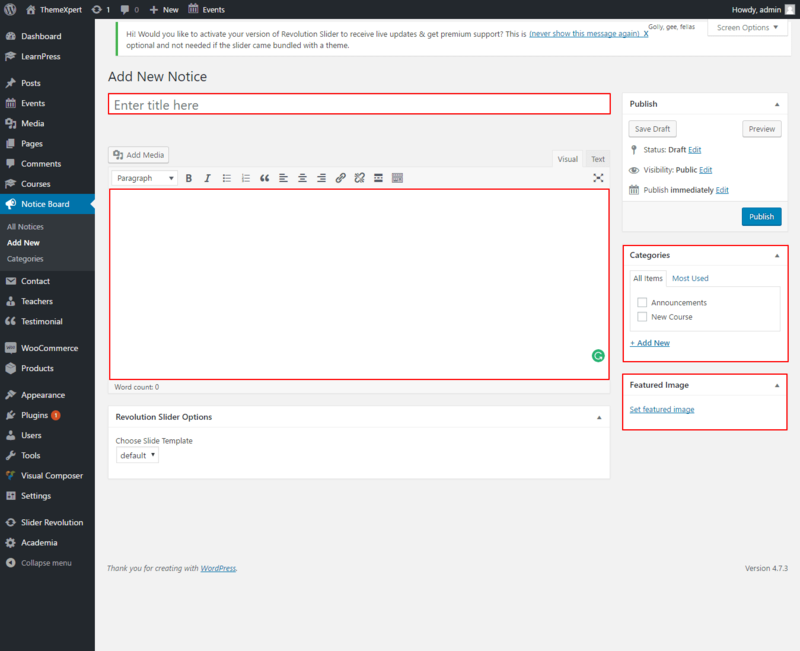 Notice Count : Define the number of notice you want to show on this module. Order : Display in Ascending or Descending order. Style : Select a style from the drop-down menu. Testimonial Number : Define the number of testimonials you want to show. 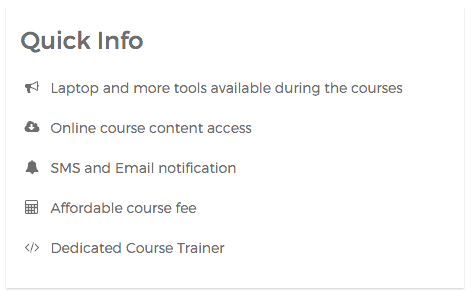 Course Item : Define the number of courses you want to show. color-white for white text color. shadow-box for box shadow on a section. bw-gradient for 50% 50% black and white gradient.